Online Alternative Dispute Resolution: the ability for an ordinary citizen to classify (Case Discovery), formalize (Case Definition) and be led to the resolution (Case Resolution) of a dispute through the use of the network and alternative procedures of dispute settlement, such as the institute of mediation. 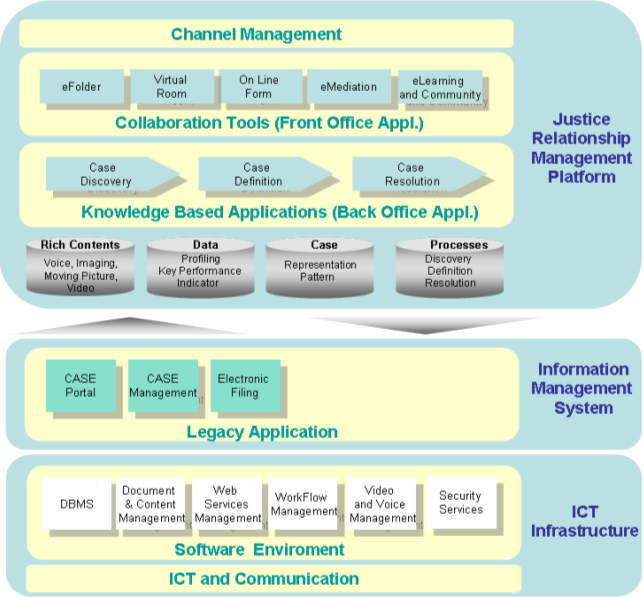 In eJRM, physical exchanges of documents, verbal interactions and collegial moments are represented in the form of relationships among the various stakeholders and are supported by IT tools (eFolder, Virtual Room, Document Automation, eLearning) designed and constructed to be safe, traceable , easy to use, verticalized in the context of use, integrated and integrable with existing legacy applications, able to support and simplify the resolution of disputed seats from recurring. This approach makes it possible to achieve the first objective, demonstrating the feasibility and portability in a fully virtualized context of workflow, typical of the management of some legal case. The second objective, somewhat more ambitious than the first, aims to demonstrate how the introduction of high value-added software applications, based on knowledge, and the increasing spread of IT tools to the End User can improve the understanding, the access and transparency of the justice system to the citizen and provide an effective opportunity of modulation of the so-called “Question of Justice” for the Administration. For this purpose, the management platform of the eJRM relations creates new opportunities for Natural and Legal Persons, such as the ability to independently assess their own legal position, the ability to support the citizen in selecting the most advantageous mode of settlement of a dispute (judicial or out of court), the opportunity to be guided through the process of not conflictual composition, i.e. to be assisted in selecting the proper legal support. The ability to code typical patterns of dispute resolution (Judicial Pattern) proposed in eJRM opens completely new scenarios, encouraging the court settlement (Alternative Dispute Resolution) where real mediators or virtual assistants (eMediation) are intended to assist the Parties in achieve an amicable and non-confrontational later approvable in Courts.